Should I Buy a Home Now? I'm often asked if this is a good time to buy a home. Some clients are concerned that home prices may fall further than they have already. They are assuming that the best course of action is to wait for the bottom in the market and then buy. The problem with this approach is that you don't know where the bottom is until you see it in the rear view mirror, meaning until you've missed it! Home prices are one factor in determining your cost of ownership, but so are interest rates and financing availability. Even though interest rates have gone up in the last six months, they are still near historic lows. Since your monthly mortgage payment is a combination of paying down your principal and paying the interest owed, if home prices come down a little further but interest rates go up, it could cost you even more to service a mortgage on an identical home! While a home is a major investment, it is also the center of your personal life. It's important to live in a home that reflects your taste and values, yet is within your financial "comfort zone." To that end, it may be more important to lock in today's relatively low interest rates and low home prices, rather than to hope for a further break in prices in the future. Please give me a call if I can be of any assistance in determining how much home you can afford in today's market. Five years ago, a home buyer could spot a bank foreclosed home a mile away. They were abandoned structures, stripped of all appliances and fixtures, with unkempt landscaping and falling down “For Sale” signs. Today, banks often renovate their REOs (also known as bank real estate owned) before listing in hopes of selling to end users, not contractors or investors who will capitalize off the bank’s loss. Banks know the market has improved, and they aren’t as desperate as they used to be. They want to minimize their loss on each sale — not simply sell as quickly as possible. This creates some potential risks and rewards for home buyers considering purchasing a foreclosed home. To help you make a smart decision, here are some pros and cons for buying a foreclosed home in today’s market. Today, bank foreclosed homes are typically about five percent below a comparable house in the same location that is not a foreclosure. In previous markets, they were often in horrible condition and about 15 to 20 percent below market. While many new buyers set out in search of the deal that comes with these sales, many REOs should be left to more experienced home buyers. Even though they are priced higher today, REOs still come with baggage. Many banks will invest money to make the listings look nice and get the prices up. In return, they are less flexible on price and less eager to sell in general. Behind the scenes, these are still risky sales. You don’t know about the history, and there are no disclosures about leaky roofs, mold or crime. And you are forced to buy the home “as is,” without any recourse if things go wrong. Investors were once fine with this risk, but they are less interested today because the “deals” are gone. Many of today’s foreclosed homes are in less desirable parts of towns or school districts. If you see an REO and the price looks good, remember that it may not be the foreclosure that makes it such a great bargain. It could be location, and you don’t want to get stuck unloading a home in a bad location in a few years. Foreclosed homes in good locations will sell quickly. Consider that you are negotiating with a spreadsheet. Unlike a typical seller who may care about your situation, your personal background or market history, banks don’t. Your offer is likely submitted electronically and placed into a cell on a spreadsheet for an asset manager to consider. If the numbers don’t work, expect a big rejection. Never get your hopes up. Buyers today can’t assume that a bank-foreclosed home is a good deal. While you can still find a needle in the haystack, they are fewer and farther between. Banks want top dollar out of their foreclosure inventory. They are sellers just like anyone else. They watch the market and read the headlines. Foreclosed homes will be priced slightly lower than the market, but they are still as-is, take it or leave it with some risk associated. Debating Between a Condo or a House...Which is right for you? Buying a home is one of the biggest and most important decisions you’ll ever make. Whether you are a first-time buyer, or a veteran homeowner looking to trade up or make a new start, you will inevitably be faced with a number of questions. Your answers will lead you to the home that’s right for you. One of the most fundamental questions all homeowners face is whether to buy a condo or single family house. There are advantages and disadvantages of each and only you can know what’s right for you. For Boston newlyweds Michelle and Kevin Millsom, 31 and 36, it was an easy decision. With high-powered financial careers and no children, they were drawn to the excitement of the city and wanted their fingers on the pulse. They bought a penthouse apartment with a breathtaking view of Boston’s famous esplanade and Charles River. Like all things, living in the heart of the city comes with tradeoffs. For the price of their two-bedroom/two-bath condo, they could buy a home three times the size, just a short 20-minute commute away. They share decision-making for their building with fourteen other tenants and pay pricey condo fees to cover the costs of insurance and upkeep. Their car sits idle most of the time in a $300 per month rented parking spot only to leave for short jaunts to the grocery store or visits to see family. But for Kevin and Michelle who want to spend their spare time out and about, the location and convenience can’t be beat. On the other hand, Adriana Forte, 62, lives in a condo in the Boston suburb of Arlington and misses all that a single-family home has to offer. 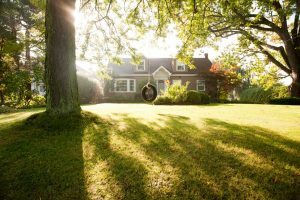 Six years ago, after her divorce, she bought a “condex,” (a two-family home with a shared wall) with the belief that managing a home would be too much for her alone. But it turned out to be the wrong decision for her. Now, she is desperately seeking a single-family house to call her own. “It’s difficult to live with neighbors so close,” Forte said. “First there was the noise. My neighbors are night people, and every night they are just getting geared up when I’m trying to sleep. Then I found myself handling 100 percent of the finances and maintenance of the duplex—without compensation. I may as well be living in my own house!” Forte also misses the fresh air and private outdoor space. For her, maintaining a home and garden is pure enjoyment. The privacy is what she misses most. Location – Where do you want to be? Are there options for both condos and single-family houses in this area? Privacy – Is it important to you to have complete privacy or do you find close neighbors to be a comfort? Responsibility – Do you need total control over decisions affecting your home or are you attracted to the idea of sharing decision-making with your neighbors? Maintenance – Are you a homebody who enjoys getting dirty in the yard or are you delighted with the idea of never having to cut a blade of grass again? Budget – How much do you have to spend? Depending on where you want to live, a condo may be the only option that meets your budget. These considerations and others will help you determine the best choice for you now. And just remember, if your interests and priorities change in the years ahead, you can always sell your home and make a move, this time with experience as your guide. Build Bigger or Go to a New Home? What To Do When You Outgrow Your Home! Many homeowners today face a serious housing dilemma. They love their home, its location, and even their neighbors. But they’ve outgrown the space. Do they trade up to a bigger or better house, thus entering a busy real estate market, or stay put and renovate? Most homeowners have never sold and bought at the same time, nor have they lived through a renovation. Both experiences are incredibly stressful, and many people don’t know what to expect. Here are some tips for making an informed decision. It’s helpful to know that it is cheaper to stay in your current home and renovate than it is to sell your home and buy a bigger one. And renovating isn’t as big a deal as one may think. If you go into it with an open mind and full awareness, it’s not so bad. However, some people are just not cut out for living with dust, disruption, and a little bit of chaos. Living through a renovation means a constant stress is hanging over you. If you can’t take that in your life, don’t fool yourself. The most important thing you need to do is understand your home financial situation. Do you have equity in your home? If so, how much, and would you need those funds to either renovate or purchase the new home? Is a home equity line of credit available to you? Using that money provides the mortgage tax benefit for the interest, which makes an equity line a no-brainer. What would you need to spend on a new home in your desired location? Just like when you first got pre-approved to purchase the original home, you need to get pre-approved and run the numbers. You may find that the house you can get isn’t much bigger than where you are, or that you have to change areas to get more space. What exactly is it that you need? An extra bedroom or bath, more family or community space, a larger kitchen or a master bath? Put it all out there and prioritize. Can these changes be made within the envelope of your current home, or would you have to expand outside your walls? Renovating inside might mean that you need to leave the home for some time, while an expansion might allow you to stay in the home during the renovation. Learn how building and zoning laws will affect your plan to renovate. Find out if expansion is even a possibility. Many people think that finishing the basement is as easy as putting up some walls and carpet and moving the TV downstairs. But did you know that you likely need two forms of egress or certain height and insulation to make a finished basement meet code? A few hours of an architect’s time can help get you the information you need. If you want to add on, make sure that your lot is big enough. Town zoning laws only allow a certain percentage of the lot to be covered. If you’re at your max, you’re out of luck. Set-back laws might mean that you can only expand in the front or on one side of the property. You may find out immediately that what you want to do simply isn’t possible, and the decision is made for you. You need a master bathroom and family room or some extra square footage, but will the neighborhood support it? You don’t want to be the biggest or best house on the block when you go to sell. A big master suite or designer kitchen may be just what you want, but will future buyers pay for it? Do some research, talk to a The Judy Reed Team and attend open houses in your neighborhood. If you don’t know, ask. But do not embark on a large renovation project if you can’t get your money back when it’s time to sell. Purchasing a new home and selling your existing one simultaneously means instant stress that is intense and compacted in a short period. The stress may come in the form of carrying two mortgages, getting a bridge loan or waiting for your home to get an offer. Remember how you felt when you purchased your first home? Now double or even triple that. When you sell your home, you need to pay the real estate commission and transfer tax on the sale, and you may be taxed on any gain. When you get a mortgage for the new home, expect more loan and title fees upfront. While many closing costs and transfer fees are tax deductible, you don’t realize anything from these expenses. The $10,000 in fees might be better spent toward a new bathroom. Before you decide to explore this path, gather some information about costs. Deciding whether to trade up or sell and buy is incredibly personal. The most obvious thing to do is to check your finances, and see what is out there on the purchase market. Learn what’s happening and understand how you would fare. And even if it’s intimidating, seriously consider renovating. It is incredibly rewarding to be able to make your home even more custom to you. Along with the natural beauty of summer comes rumbles of thunder, high winds, flashes of lightning and heavy rain —all of which wreak havoc on properties. Wind can completely uproot saturated trees and break branches when summer storms hit. A hazardous tree that is sick or damaged can cost potential homebuyers thousands. Not to mention the severe impact on the landscape—one of the biggest contributors to a home’s value. Identifying common defects in trees before a storm hits is crucial to preserving precious curb appeal. Homeowners can prevent damage to their property in a few simple steps. Look for clear signs of damage. A tree with an abundance of dead branches has a higher potential to be impacted by stormy weather. Deep splits and cracks that extend through the bark and into the trunk signal signs of severe damage. In advanced stages, decay, wood cavities and cankers can create hazardous conditions. Weak branch unions that are fused by bark also signal declining tree health. When it comes to stormy weather, heavy tree canopies act as sails that catch wind. Branches and heavy limbs could barrel toward the home if not properly cared for. Poor tree architecture is characterized by excessive leaning or branches growing out of proportion with the rest of the crown. Odd growth patterns may indicate general weakness or structural imbalance. Without a strong root system, trees are more likely to blow over in stormy weather. Look out for nearby construction that may sever large roots or compacted soil that doesn’t allow for healthy root growth. The solution to keeping happy and healthy trees is simple: proper care and tree maintenance. Regular pruning thins the tree canopy, allowing wind to blow through it instead of against it. Pruning also removes potentially hazardous dead or weak branches. Landscape inspections are crucial when it comes to increasing curb appeal. Schedule a consultation with a certified arborist to evaluate tree species, soil conditions, wind exposure, defects, overall health, and to determine a tree’s hazard potential. Before you start going to open houses, pay down high interest debt now. The higher the interest, the higher your priority should be in getting it squared up quickly. Many people pay close to the minimum on their credit card debt in favor of growing their savings, despite the fact that their payment often doesn’t even cover interest. Monthly interest for credit cards for people with near perfect credit can still hover around ten percent or more, often double or triple your student loan payments. Pay down your cards as quickly as you can, and only use them in an emergency situation. With this extra interest-payment savings, you can pay additionally on your student loans, lessening their overall burden, or tuck away money for a down payment. This will improve your credit score too, helping you get better terms on your loan. Be mindful of your Debt-to-Income ratio. One of the biggest factors for people who can’t get a loan despite having a good job and some savings is their DTI, or Debt-to-Income ratio. Lenders study your monthly income compared to how much you spend paying down debts such as your loan payments, credit cards, auto loans and any other installment or revolving debt. This is among the biggest hurdles for people with student loan debt in getting loans. Look into where your DTI is early in the process so you know how far away you are from securing good terms on a loan, then make actionable steps toward that goal before you sit down with a lender. Investigate down payment assistance programs. Chances are if you are making payments towards your student debt, you aren’t putting a large amount of money aside for your down payment. Many young people who have smaller savings look immediately to FHA loans, but especially in high dollar metros in places like California or New York, your FHA standard 3.5 percent can still cost tens of thousands of dollars (plus, many have higher interest rates and require mortgage insurance). Every state and many cities have programs in place to assist qualifying homebuyers in paying their down payment. Whether they’re helping first time buyers or stabilizing neighborhoods, down payment assistance programs can be a great help to buyers whose savings have been affected by their debt load. Sometimes the needs of the market lead people to innovate in ways wholly unfamiliar to generations before them. For our parents’ generation, signaling a stranger to drive you around was called hitchhiking; for our generation, we call it Uber. The same type of dynamic exists in financing your investment. If you’re starting out with debt, getting more people on board or looking for a different way to kick off your investment can lessen the initial weight you carry. Alternative approaches to financing, from crowdsourcing collectives and co-ops to pitching in with trustworthy friends to get off the ground, are becoming more popular as the cost of buying a home increases in major metros. Other alternative financing strategies such as buying owner-financed homes, rent-to-own and developing vacant land are also growing in popularity among creative youngsters looking to get started sooner rather than later. Swing a hammer like your grandpa did. Chances are, if you are a young and indebted person with limited assets to work from, a distressed property that needs some renovation will be more in your range than a new or updated turnkey home. Do what you can yourself to save money on contractors. Remember to consider the cost of your renovation and the degree of repair that is needed; the cost of contractors can vary widely from region to region based on demand and availability. Above all, buy a home that is going to make you money, not just the one you can afford. Thanks to advances in real estate data, we are learning more and more new things about the types of trends that appeal to different buyer demographics. Buying a home with a higher walk score, for example, can boost your rate of appreciation more than homes in car-reliant neighborhoods according to several studies. Know about buyer trends and get a home that will earn you money in the long term, rather than trigger migraines. People whose lending options are limited may feel pressured to aim lower on the quality and location of the home they invest in for obvious reasons, but often it’s better to wait than buy an unmarketable property. With time and patience, young people who are still paying off their education can get started on buying a home. Growing an investment with a moderate student debt burden requires preparation, but it can be done — and done successfully! If done right, buying an investment property can provide you with the type of financial security that even makes it possible to pay off your debts more quickly than expected. When you’re ready to buy your first home, you’ll probably remember those three important words we always hear about real estate: location, location, location. While the geographic location is important, it’s also the amenities around the location that make a house a home. Every buyer is different in what they desire, so you need to find a neighborhood with the location and amenities that fit your desires — and, just as importantly, your budget. Location is one factor that will heavily influence the price of a property. You don’t want to shop in locations you can’t afford — even though it might be fun. The first task in your home purchase process is getting pre-approved by a bank or mortgage lender so you understand the ballpark within which you will be playing ball. Inform your real estate agent about your price range so they can identify the locations where you can afford to purchase. You also need to figure out what works for you when it comes to the type of location you like: urban, suburban, or rural. Many people live in and love high-density areas where retail, restaurants, gyms, and grocery stores are all within a few blocks’ walk. It’s nice to be able to walk to everything — but with that comes lots of cars, people and sometimes noisy neighbors. Other home buyers prefer quieter suburban developments that are probably going to require driving for one’s commercial and entertainment needs. Then there are rural folks who want full quiet and no nearby neighbors. Make sure before you shop that you are shopping in the right type of area for you. Schools also make a big difference for many buyers, and a buyer will certainly pay for the best school district. School quality is one of the top items on a parent’s mind when looking for property. You can search the Internet for school ratings and check with the city or county for more information. Of course, if you don’t have children, it’s not as big a deal. You should also always consider what is next door to the property you buy. Will you be living among lots of single-family houses, or big apartment buildings? It’s also important to know if there are currently or once were gas stations or chemical plants nearby. Drive around and look, plus check Natural Hazard Reports to see what is or was in the area. Additionally, be cautious about empty developable lots or empty retail/warehouse properties nearby, as you never know what might end up being built there. It’s also smart to understand the zoning on your property, as it might let the single family home next door be torn down and developed into a 4-plex rental property. That might or might not be okay with you, but you should be aware if it’s a possibility. One more important item to consider regarding location is your chances of owning the property a long time. If you are not sure you’ll be happy staying a while, you’re better off passing on buying for the time being. Considering all these issues — as opposed to making a quick purchase decision based on what your heart is telling you — should help you buy a home that is a good fit, will serve you well, and will be a good investment for your future. Looking For A New Strategy? How Does the Color of Your Home Affect Buyers? It’s no secret that color is crucial when marketing a product. In fact, consumers come to a subconscious conclusion about a product within 90 seconds of viewing, and much of that judgment (62-90 percent) is based solely on color, according to the Institute for Color Research. Retailers apply these findings every day (think red sale signs) to encourage consumers to purchase their products. Can the same be said in real estate? Consider this: If color influences product marketing strategies, the color of a home can be a decisive factor when selling. Similarly, understated browns (including the aforementioned tan) signal security. Homes painted in sandy or mushroom hues read comfort and warmth. Colors like taupe, which falls somewhere between brown and gray, call to mind traditional values, homeownership included. Earthy tones like laurel green or artichoke can not only highlight a verdant landscape, but also evoke a sense of tranquility. Per eBay’s assessment, blue is ideal to move product because it transcends culture. Homes outfitted with a dusty blue or blue-gray exterior may not bridge the gap between your everyday seller and an international homebuyer, but a universally regarded color can help widen the net for buyers on the home front. If red signs boost retail sales, it seems likely a red home would be ideal for a speedy sale. Not necessarily – red in small doses, such as sale stickers or tags, encourages action. Red on a grander scale can cause adverse reactions. An alizarin crimson door, for instance, might be well-received by buyers, but a house in the same shade could potentially limit offers. Homes in other colors can sell successfully – our retinas tend to register yellow before any other color, so a buttery yellow exterior could be an attractive option for buyers – but non-traditional colors, like oranges and purples, appeal to very specific personalities and can significantly shrink the pool of interested buyers. It’s important for sellers to consider the home in relation to the neighborhood before swapping out the exterior color or refreshing an existing paint job. Do nearby homes share a distinct color scheme? Is each home uniquely colored? Evaluating the home’s surroundings can help sellers determine what’s most popular in their market.